When it comes to the things we don’t particularly enjoy doing, we all look for an easy way out. This could not be truer than when the tasks in question involve cleaning your bathroom! Of course, taking the easy route isn’t really an option if the results are unsatisfactory by the end of your efforts (however minimal they may be). On top of this, having to spend extra money on different types of cleaners is used as yet another “excuse” to avoid bathroom cleaning altogether. So, how can you save time and money when cleaning up your bathroom? Well, these bathroom cleaning hacks will help you with that! Read on. 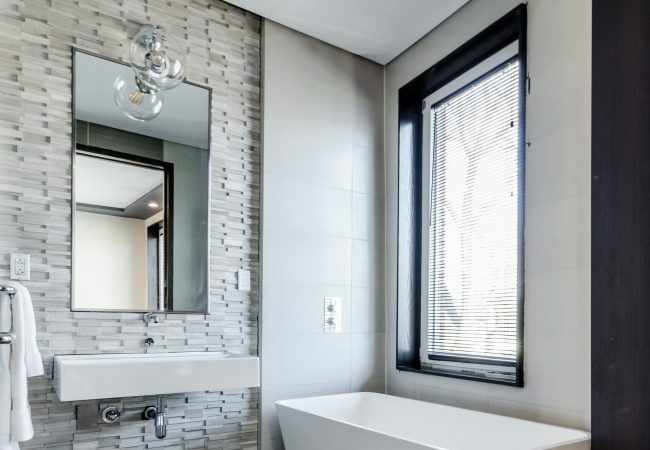 We often overlook wall tiles when cleaning our bathrooms and hence, end up with some pretty stubborn stains. While these can be removed with (typically expensive) store-bought cleaners, alternatively, you can make a low-cost, homemade stain remover for your wall tiles. Simply mix 1 part liquid dish soap and 2 parts water; measure this amount and add an equal part of heated vinegar to the mixture. Pour this solution into a spray bottle and shake it well before spritzing stubborn stains on your bathroom wall tiles. Allow the cleaner to break down the grime for a few minutes before scrubbing them away with a tile brush. A scummy bathtub is highly unsanitary and very unpleasant to look at! Unfortunately, tubs get rather grimy after every use; therefore, regular cleaning is a must when it comes to keeping a bathtub sanitary and ready to use. For this, plug the drain of your bathtub and fill it up with a little hot-lukewarm water (just about quarter of the tub will do). Add in 1 cup of vinegar and 1/2 cup of baking soda; swirl the water around so that the ingredients mix (make sure that the water isn’t too hot to touch). Next, soak a clean scrubber in the solution and start scrubbing grime away. If the water becomes too soiled, drain it out and make a fresh solution. Cleaning your toilet bowl is definitely not a fun activity; however, it can be a really simple task with this awesome cleaning hack! All you need is some Coca Cola and a toilet brush. Pour a can or two of the cola into your toilet and allow it to sit for as long as possible (2-3 hours is good enough). By the end of the sitting time, use a toilet brush to clean the interiors and finish off by pulling the flush. So simple! Although your sink is one of the easier bathroom components to clean, it can be done quicker and more effectively than usual with this cleaning hack. Make a solution of 2 cups water, 1/2 cup lemon juice and 1 tablespoon baking soda; stir it up and transfer the mixture into a spray bottle. This can be used to simply dampen your sink before giving it a wipe down with a clean sponge/scrubber. Remember to shake the bottle before every use so that the contents mix well which, in turn, make the cleaner more effective. From toothpaste splatters, to soap scum; bathroom counters can get pretty dirty if not cleaned on a daily basis. To remove this grime effectively, mix equal parts of water and vinegar; dip a soft-bristled brush into the solution and scrub the counter using circular motions. For stubborn stains, heat the mixture up and then apply it to the counter. If you’d like to buff your bathroom countertop, simply dry the surface and sprinkle some lemon oil onto it; crush an old sheet of newspaper into a ball and use it to buff the counter. It doesn’t take long for stainless steel bathroom components to encounter stains and dullness. Fortunately, cleaning and buffing them is pretty easy! First, you need to clean the steel using a scrubber and minimal amount of dish soap. After you’ve rinsed off your bathroom faucet/fittings, take a dry washcloth and dab on some petroleum jelly; use this to buff and shine stainless steel components in your bathroom. Be sure to use a minimal amount of petroleum jelly as that is all it takes to get steel surfaces shining! Like stainless steel, grout lines are also quick to accumulate dirt. They get discoloured rather easily when grime and soap scum have had even a little time to rest on them. Hence, it’s important not to overlook grout lines when cleaning your bathroom floor. For this, mix juice and cream of tartar; use an old toothbrush to cover the grout with the paste and leave it for 20 minutes. Next, use the same toothbrush to gently scrub the grout lines for a few seconds before washing the paste off. Yet another victim of soap scum and toothpaste splatters, the mirror in your bathroom needs to be cleaned at least once a week. Thankfully, it’s really quick, simple and inexpensive to do this! Simply take a clean, soft cloth and apply a little shaving cream to it; use this to clean your mirror by buffing it in circular motions. Do this until all the cream has vanished and you’ll be left with a sparkling bathroom mirror! With these bathroom cleaning hacks, you’ll be spending a lot less time and money on each and every task! Previous Post: 10 Tips to Make Your Bedroom 10x More Appealing!